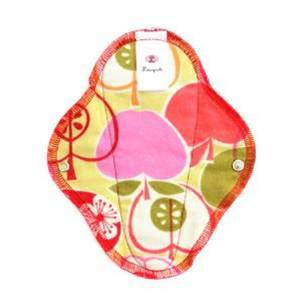 Mini Pantyliners are 20cm long and 16.5 cm wide. Made with 2 layers of 100% cotton flannel topped with a 2-layer pad of 100% cotton fleece. Sewn-on single plastic snap fastener. Suitable for daily discharge, very light flow or as backup protection with a Mooncup. Not compatible with Liners.